"Fireplace Floor Plans Customized Just for You"
Are you searching for custom fireplace blueprints for your family room or another area of your house? If so we can help. As you know, a beautiful fireplace adds warmth and a bit of luxury to every room. There are plenty of fireplace designs across the web. Depending on the style of fireplace you are after, you may need a set of fire place blue prints to accurately depict to your contractor, and local building code office, what you are trying to achieve. Here at Cadtech Design, we can take your ideas, concepts and sketches, and transform them into customized fireplace CAD drawings that can be printed out from your home into a set of fireplace floor plans. These drawings can then be taken to your building code office for approval. If you are working with an architect or professional designer, you may be able to save a few dollars upfront by providing them with accurate computer generated drawings upfront. Since many municipalities have different regulations, you are going to need to gather all the important fireplace building code information before hand, prior to sending us any of your sketches. 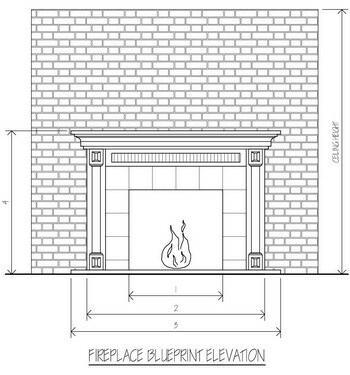 You can send your sketches, scanned image files, and other pertinent information, by sending us your fireplace blueprints info. Once we receive all this important information, we will contact you with a quote for creating the fireplace CAD drawings you will need to build your dream fireplace. Bear in mind that once your building code office reviews the fireplace drawing, it may ask you to revise some items to suit their codes and expectations. Simply send us these revision requests, and we will provide you with an updated set of fireplace drawings.